Internal table processing is essential part of any ABAP program. Generally, we use the explicit work area to process the internal table like appending & modifying records. We can reduce the time and improve the performance of the program by using the field-symbols. Check out Code Snippet ABAP Field Symbols usage to know basics from usage from declaration, append, insert, read, modify to check using IS ASSIGNED. Also check out ABAP Field Symbols usage – Advanced use to know bit more advanced usage of Field-Symbols. When we use the LOOP construct with the explicit work area, system need to engage the resources to put the required record in the work area, process it and move it back to the table if the needed. This additional processing time could be saved by using the field-symbol. 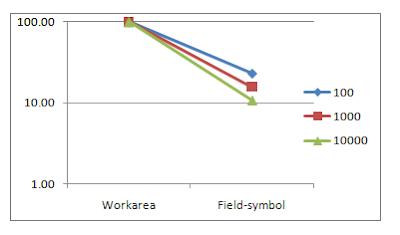 By using the field-symbols we can save this additional time and improve the performance. Field-symbols are similar to de-referenced pointers in C. While using the field-symbol, system uses the same memory allocated to that particular field in the record instead of moving it to work area and processing. More on field-symbols can be found at: Field-Symbols on SAP Help. This code snippet shows how to use the field-symbols to process the loop with time measurement. wa_bseg LIKE LINE OF i_bseg. FIELD-SYMBOLS: <fs_bseg> LIKE LINE OF i_bseg. SELECT * FROM bseg INTO TABLE i_bseg UP TO 100 ROWS. LOOP AT i_bseg INTO wa_bseg. WRITE: /(15) 'Work area', lv_diff_w. LOOP AT i_bseg ASSIGNING <fs_bseg>. lv_diff_f = lv_end_time - lv_sta_time. lv_save = lv_diff_w - lv_diff_f. WRITE: /(15) 'Total Save', lv_save. In this performance measurement, time taken by the work area to process is considered as the 100%. By using the field-symbols, we can definitely improve the performance. I have enjoyed both of the loop posts. Although I use your techiques, these posts are an excellent way to show the newer ABAPPERs. This is a good one for new comers….. Hoping for other readings ……. i copied the whole code what u have given in abap editor but it is showing all the values as zeros…. Probably, you don’t have data in the table BSEG. If you don’t have data, you can replace the select query with DO… ENDDO. thanks buddy for u quick reply. i tried to open the contents of the bseg table but it is showing the run time error that storage error. like sap r/3 has requested os ****bytes of memory with malloc but it is not there . at the time of installtion blablabla…. what can i do now to check the contents of bseg. I am not much familiar with that problem. Looks like you need help from BASIS / DBA. If you want to test the program, you can replace I_BSEG with any other internal table. Replace the SELECT query and also make sure you change other references accordingly. Need simple way of understanding the concept behind Radio Button , Radio button group by index and Radio button group by key in Web Dynpro with simple example please. Define their differences and also when to use what? Great article and well written ABAP code snippet. when i created report the header and footer is displayed but when the report is ended before the line count as mentioned in the program the footer is not displayed then how to display the footer in the program when the report is ended before the line count.